I am one of the signatories of this letter. The below open letter and pledge were developed by a group of Armenian feminists residing in the United States, Canada, Europe, and Armenia in response to a full page ad underwritten by the IDeA Foundation of Armenia (www.idea.am) that ran in the New York Times on Oct. 28. 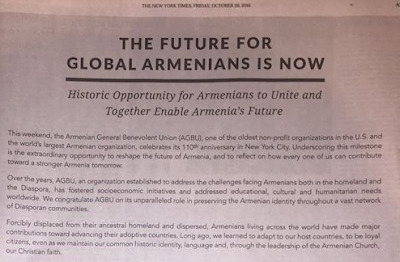 *A part of the full page ad underwritten by the IDeA Foundation of Armenia that ran in the New York Times on Oct. 28. Over 80 Armenian feminists, both women and men, from Armenia and throughout the Armenian diaspora, decried the gender disparity in the “Global Armenians” advertisement signatories list, which they see as symptomatic of the sidelining of women in Armenian communal institutions. The New York Times ad was signed by 22 men and one woman. As a means to address the ongoing exclusion and tokenism represented by the ad, and which they say is endemic in Armenian organizations around the world, the feminists pledged to condition their involvement in Armenian community forums on the presence of other women. Those who signed the pledge come from a variety of professions and hail from cities ranging from Los Angeles, Toronto, New York, London, Paris, Berlin, and Yerevan. 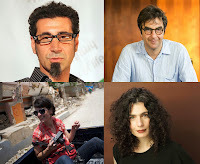 Among the signers are prominent feminist activists from Armenia, including Lara Aharonian and Maro Martosian; producer and actor Arsinee Khanjian and filmmaker Atom Egoyan from Canada; novelist Chris Bohjalian, human rights leader Sarah Leah Whitson, journalist Lara Setrakian and photographer Scout Tufankjian from the U.S.; and Berlin-based artist Silvina Der Meguerditchian. Academics from the U.S., U.K., and France are heavily represented. “I think it is high time this issue of excluding Armenian women was called out because despite past criticism about the gender imbalance in Armenian circles, things are getting worse,” Armine Ishkanian (U.K.) stated. 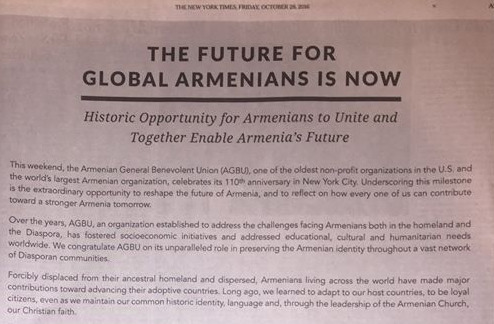 On Oct. 28, a full-page advertisement appeared in the New York Times claiming to represent “Global Armenians” and sounding a call for unified action. It was signed by 22 men and one woman. Armenian women are leaders, thinkers, artists, teachers, and philanthropists around the world, but with one exception, these women were not among its signatories. While it is an open letter and invites others to join, the discrepancy in participation between men and women cannot be ignored. The letter itself calls upon the government of Armenia to adopt “strategies based on inclusiveness and collective action,” but the process of drafting and publishing the letter should have modeled those same ideals. In an effort towards preventing this kind of exclusion and tokenism, we the undersigned pledge to condition our involvement in Armenian community forums on the participation of other women. One is not enough.